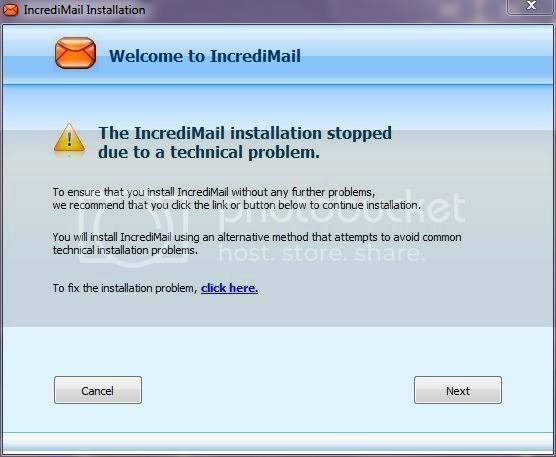 This is the second time in a couple years, that I have had problems updating my program Incredimail. I LIKE Incredimail, I've used it for many years. The last time that I got these error messages, I finally set up a new user, and gave it full administrative privileges. When I needed to update IM I would go into this user, and update the program in there and it updated for my user also. NOW I'm getting the same message in both accounts? I am the only one that uses this computer, so it makes no sense to me, to keep setting up user accounts. I realize Win7 doesn't like this program...I worked with the IM tech. support last time before doing another user account, and they insisted that it was my problem, not an Incredimail problem...I hate to say it, but I guess this is true, as I have had this same problem updating another program. I have two attachments if I am ever allowed to attach a jpg. Last edited by HappyAndyK; 15th January 2012 at 04:47. Reason: Images added. Hi Janice, you could post the URLs of the images, without writing www/http and someone will fix the URL for you. Janice: Have you tried Right-Clicking the program and Run as Adminstrator? Sorry I plead ignorance, how do I post when they are just jpg's on my desktop as captures?? ^ OK, the easiest option - mail them to me on "thewindowsclub at hotmail dot com" and I will upload them for you here. To begin with Run sfc /scannow and see if it else you. In an admin command prompt window which opens, type sfc /scannow and hit Enter. The sfc utility will run for a while and if any corruptions are found, replace them on re-boot. Or you could download our File Asociation Fixer and use it to fix VBS. Type regsvr32 jscript.dll into the Command Prompt and hit Enter. More details can be found here at MSDN and Microsoft.